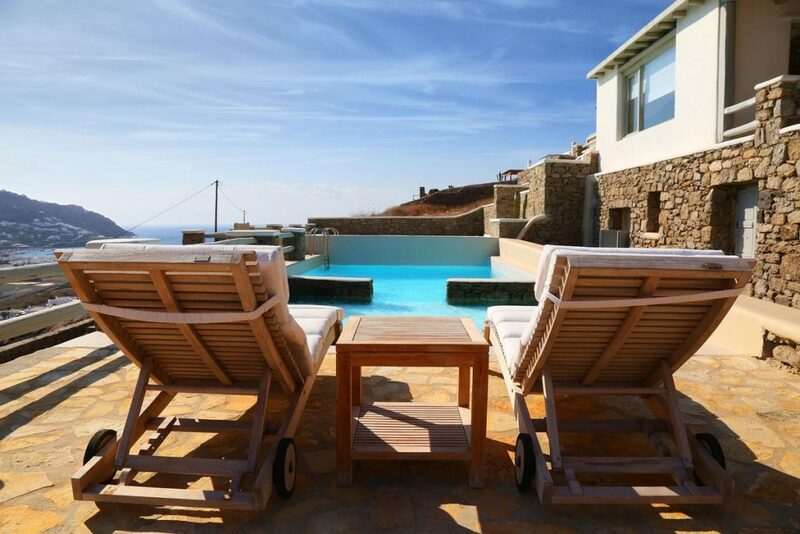 Warming up for luxury family holidays in Mykonos? Welcome to Villa Sophie! Enjoy the most relaxing experience with a group of 9 family members or friends. The beach and the town are less than 3.2 km away, so you don't need to worry about driving long distances with children! Of course, the private pool is very charming as always, so we wouldn't blame you if you wanted to admire the view from the terrace all day long! The three-level villa has plenty of space outside. Sink in a lounger and get a suntan, relax in the shaded pergola with your book or prepare a BBQ sunset dinner! Keep your mobile close at hand, because you won’t resist a selfie in such a view! The interior space is equally promising. There is plenty of space to relax since every room is huge. All rooms are cozy and pleasant and the sunlight jumps from all the windows to make your day bright! You will find all the facilities you may ask for! But in case you want an extra flavor of unique holidays, then call our concierge. She will book for you an unforgettable experience! Tailor-made planning is our second name! 1 bedroom with single bed (1.00 x 2.00m), built-in side desk and en-suite bathroom. Double patio doors lead out to a small private yard with another door leading to the exterior seating and pool areas. hairdryer, A/C, flat screen TV, patio doors leading out to the internal tunnel, kitchenette. An amazing villa close to the beach, with a beautiful view, swimming pool is fantastic, my family really enjoyed preparing the BBQ for dinner, top recommendation.